Welcome to Project Life 2012 | Week Nineteen. This week made me super happy when I was putting it together. I felt like I had a little more time to play - nothing monumental, just a more relaxed pace. Loved adding in a bit of stitching. I put together a short video overview that you can check out at the bottom of this post. DESIGNER DIGITALS QUARTERLY SALE | Also, don't miss the Designer Digitals Quarterly Sale happening this weekend. 30% off all products in the shop. 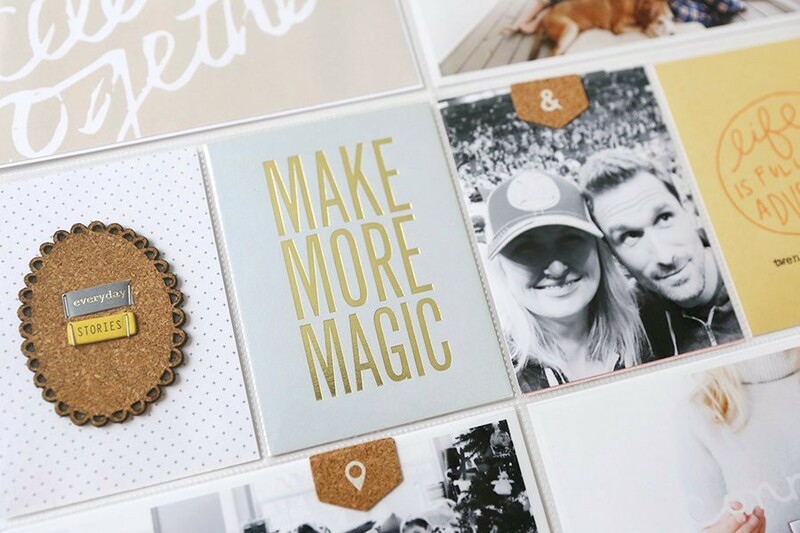 If you are interested in learning more about working with digital products, including how to use them in projects like Project Life, check out my free series on Getting Started With Digital Scrapbooking. 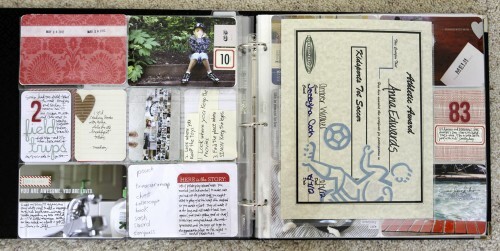 The single 8.5x11 insert includes a soccer certificate on one side and Mother's Day cards on the other side. 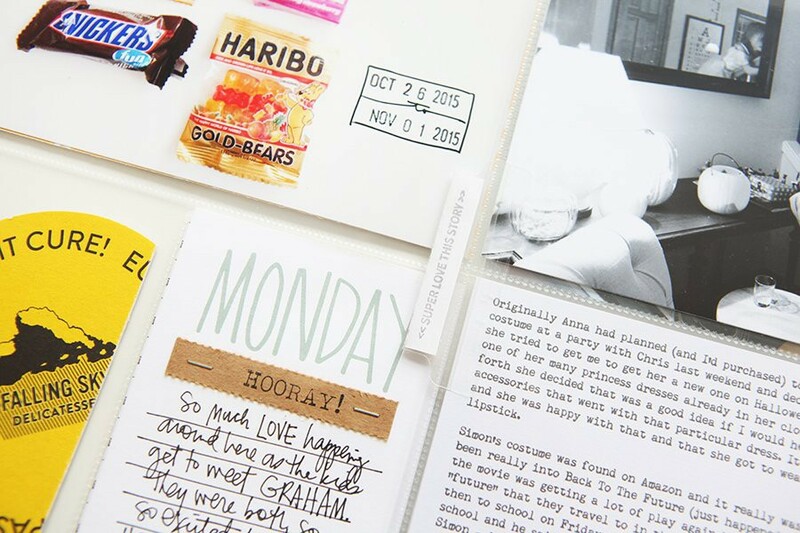 Cursive letter stickers are Studio Calico Abroad Addy Aqua. The square tags/flaps on Simon's photo are from Bananafish Studio. I used one of those 4x6 flip pockets to get two more photos included this week. How can I not love that butterfly? I did lots of just adding words onto my pictures in Photoshop this week. It's such an easy way to get it done. 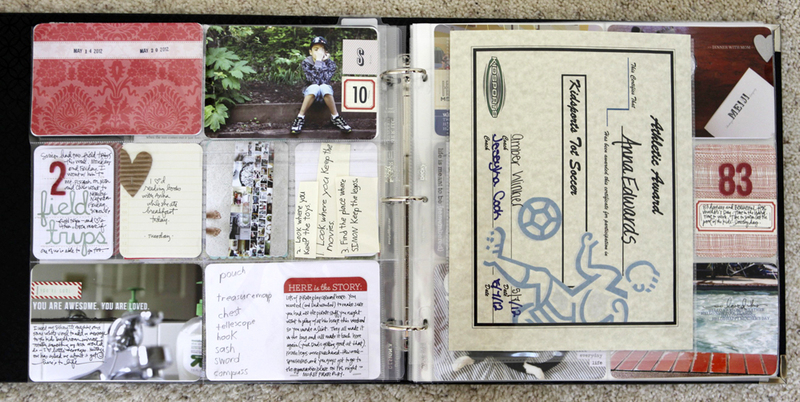 Tim Holtz Chitchat Word Stickers on top of the photo of George. PL2012 | WK19 from Ali Edwards on Vimeo. I'm not even a cat person at all, but that picture of George is hilarious. Another great layout. I see that you used the 4 x 6 flip pockets, I have used those in the past and can't get them to line up correctly despite many efforts. Do you have any tips for making the photos all line up? I cut them to fit on the side and sew it together, you could also seal the edge with washi tape. Hmmm - no tips, I think they will slide around (just the way it goes) a bit. I tried to make sure that the top area of the flip pocket lined up with top area of the PL pocket - that was about it. Thanks for the video overview Ali, it really makes your album come alive for me. 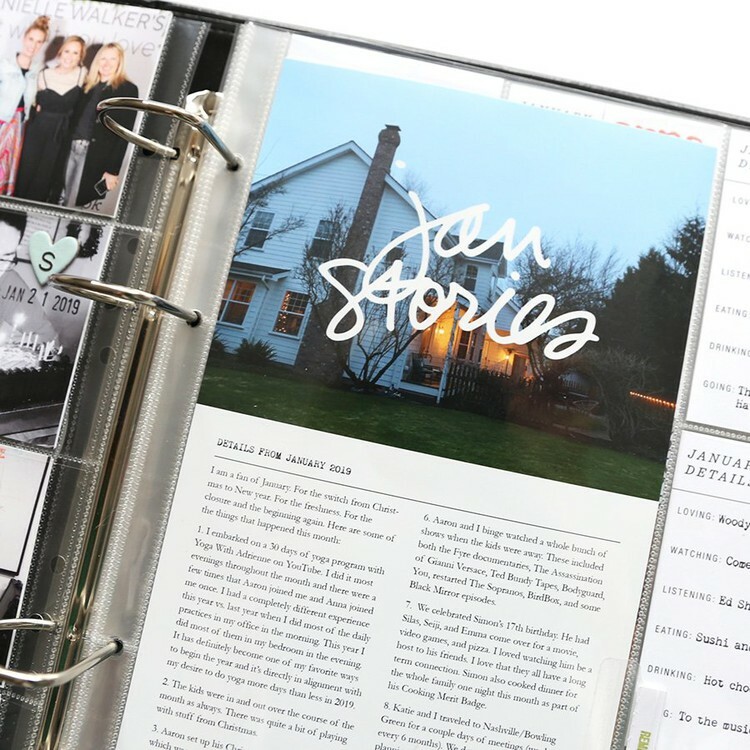 First off, your blog is awesome, loving reading and seeing your life, Simon's & Anna's. I have a couple of questions. I noticed that you put a lot of your kids' artwork in your PL book which I think is totally awesome. My question is do you put all their artwork in there, just your favorites, or the extras that didn't make it into their book. I'm not sure if you saw the video that Becky Higgins did about all the extra artwork that she didn't know what to do with and how she took pictures, cut it to size, etc and put it all into PL pages for each child. Do you have albums like that for you kids. 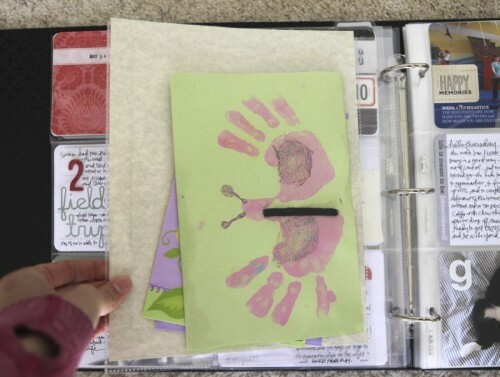 I know that each child has their own album(s) but do you include their art work in there? or that what PL is for? Just curious. Hi Andi - I don't put all of it in there. I usually save the few pieces you see here and there and recycle the rest. I have a pile of large painted pages that Anna's done throughout preschool that I want to do something with but I'm not sure yet. 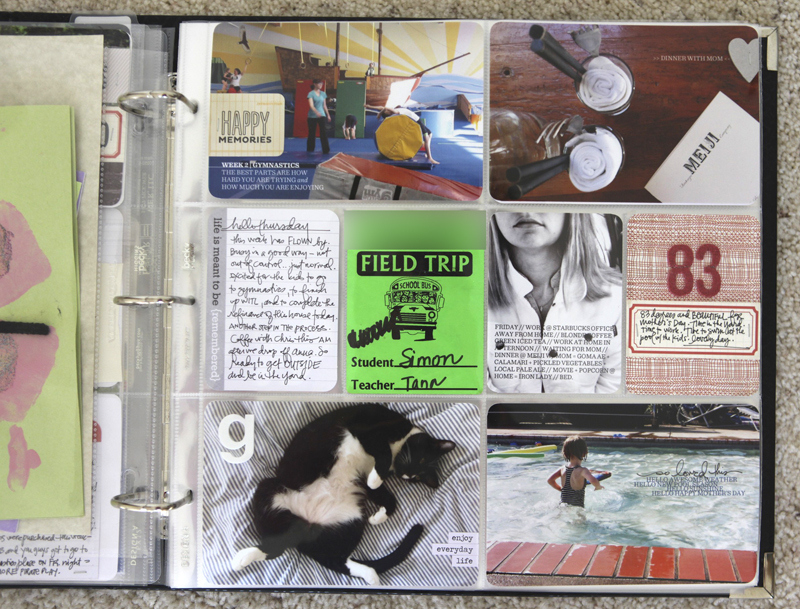 I also have some tubs that have Simon's past school work inside - for now that works for me. you inspire me to get caught up i am a month behind...but i have a good excuse!! you see, scrapbooking saved my grandson for us..my son has been in a court battle for visitation rights to his 9 yr old step son he has been in our lives 7 out of his 9 years we love him to pieces!! my son and his wife split up last year and have 2 other children together she has been with holding the step son as punishment towards my son for what ever reason she can think of to make a long story short...i quickly compiled a scrapbook of him at family reunions, potluck dinners, or just hanging out with family the clincher (no pun intended) was a picture (out of focus, not my best work) of my son and his step son hugging each other...the court ruled in OUR favor my son will NEVER make fun of my scrapbooking again!! I am thinking that you might need more than one alb to store your Project Life for each year. Is that so? I do - last year I had three. Can we still sign up for the 31 Things class or is it too late? Not too late - here's the link: http://www.bigpictureclasses.com/31things.php. Registration closes on May 23. 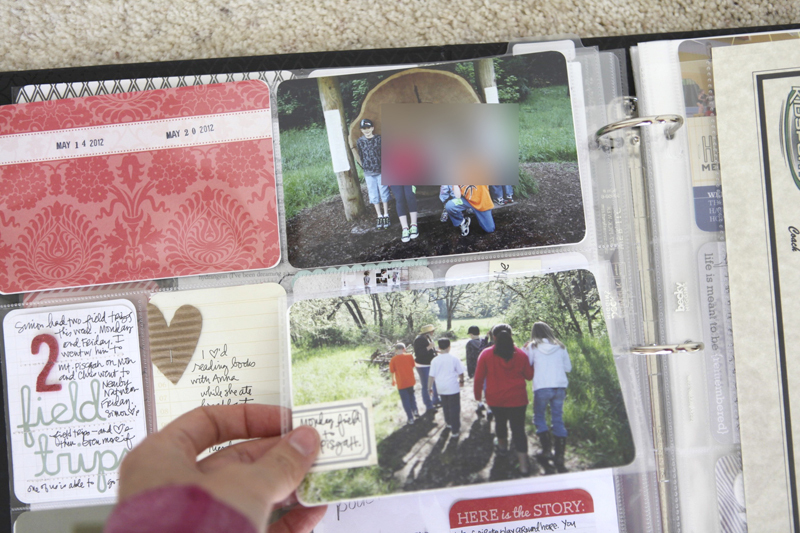 I love that you use the 8.5x11 and different sized pockets in your 12x12 album. It really adds a nice dimension. I really want to learn how to...well I don't know what it's called in english, that thing you do to not show the faces of other children to protect their identities. Have you ever talked about how to do that so I can read it? My oldest daughter doesn't want her sons face to be shown online so I need to learn this. The video - it felt like I was right there with you. Super! Thank you. I love how you include you in your album. I aspire to do that. The videos are my favorite! Thanks for the inspiration. You mentioned printing out a 12 x 12 photo. Do you have a printer that can do that? If so, which brand? I'd love nothing more than to be able to print that size!! Have a wonderful weekend. Still totally fan of your PL! Thanks for the video. 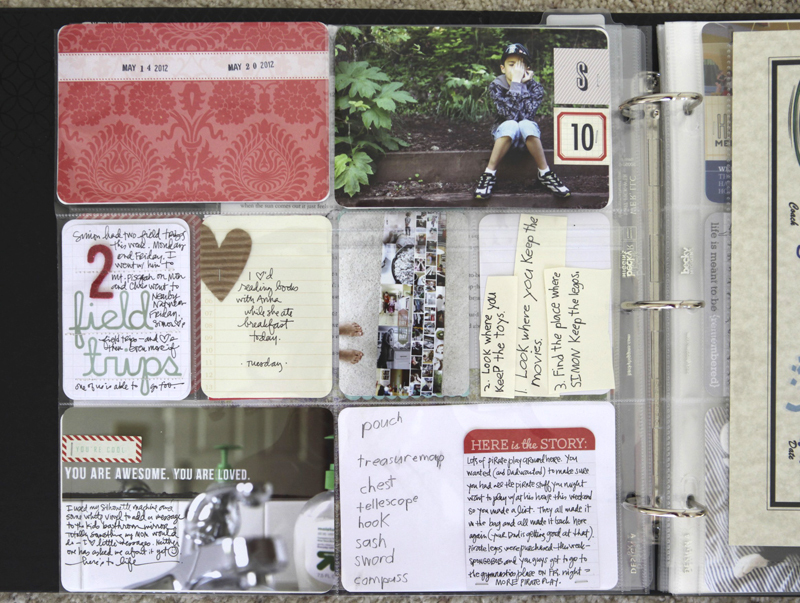 I really love how your project life is coming along. Have a great weekend! 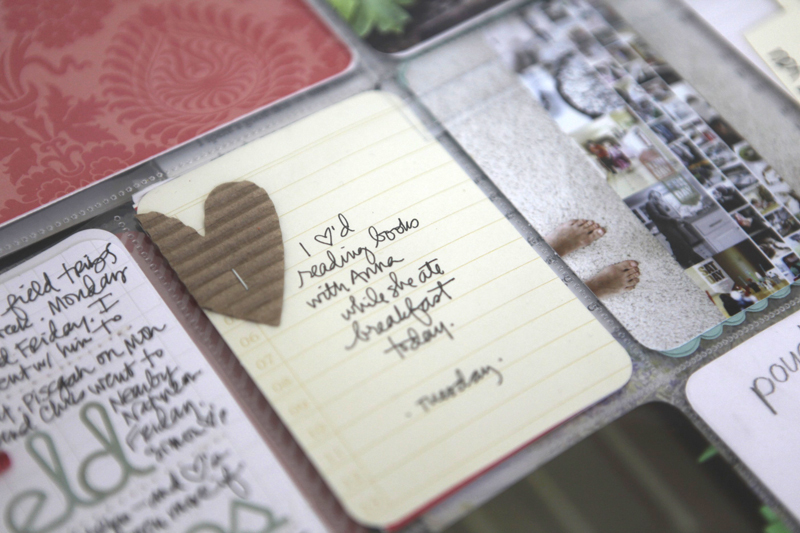 Hi Ali, I just wondered what font you use when you add journalling directly to your photos .... I've been searching for something like that. Thanks for the inspiration, love your work. The one I've been using is called Sentinel. Thanks for the video. I love the way you stroke your album pages, I do that too. Thanks for the inspiration ali!! I was wondering do you print your instagram pictures on your little printer? I have - and I've used my large format too. They both work fine. Hey Ali--great video! can you tell me where you got the red paper you used on the temperature card? I love it!! That's actually from some paper from West Elm last Christmas - paper they used to wrap products up after purchase. I've learn a few good stuff here. Certainly worth bookmarking for revisiting. I surprise how so much attempt you set to create this type of excellent informative website. Good way of explaining, and pleasant piece of writing to get information on the topic of my presentation subject matter, which i am going to present in university.